My "steemgigs" Witness Is Now On The Recent V19.6 & Other Updates. My "steemgigs" witness have been upgraded to the more recent version 19.6 from the version 19.5 that it was. This is a relation to a patch released by steem to fix a bug. This was a quick process and didn't require a replay. In the long run, i will be shifting to version 19.11, the patch that allows unlimited edits of posts, when more of the top 20 witnesses have decided to shift and the version attains a stability and this is likely to be soon. As this switch is very likely to require a replay and a period during which the witness will be disabled (temporarily) for maintenance, i am will have to look for a timely time to carry this out. I will likely do an update post regarding the temporary disabling to inform "everyone" who supports my witness and potential supporters. I also wanted to use this post to speak of a full public RPC 256 GB RAM node that once was active on on steemd.steemgigs.org It is no longer active though may still be listed on different portals across steem as a valid node but it is inactive. 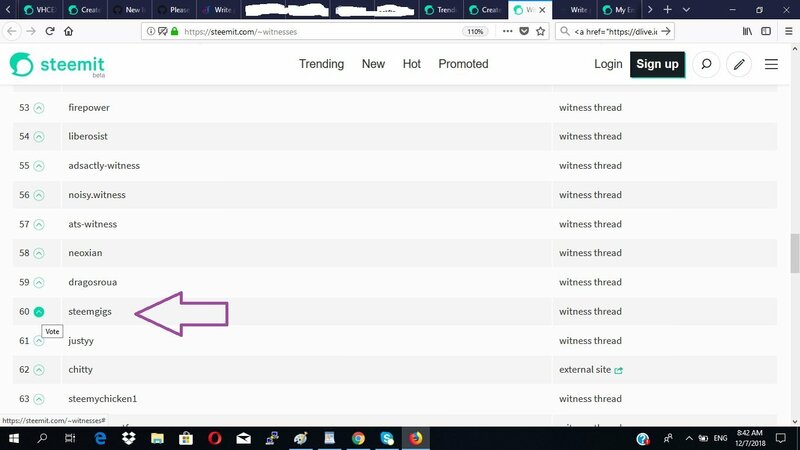 Thus, i had decided to have more focus and divert expenses towards the development of https://steemgigs.org after running the steemd.steemgigs.org 256 GB RAM public node for many months. More recently though, steem has made endeavors to reducing server requirements for witnesses and nodes by the application of Appbase; thus, in due time especially, when some of my steem-based interfaces are in stable motion, i will love to go back to contributing a full RPC node to support the steem ecosystem as i very much love steem and heartily seek its growth. https://steemgigs.org has been pretty inactive too. Its use has drastically reduced in relation to slowed development. In recent times, development on steemgigs.org has been slow due to many factors. It is not a very easy site to build overall and even with a development budget, development has stalled as there are many other factors that come into play apart from a budget. For as much as possible, i want to build interfaces that are practically free, so even with regards to a team, we need to share "a mindset" in this regard. While it appears easily like a freelance marketplace, steemgigs.org was a ecosystem for "SteemGiggers" (Dream-builders). Considering also that we want to apply the use of the teardrops SMT among all our interface, we have to take things slow, to build models that will give our token spanless value beyond just a spendable currency. The teardrops token is "an emblem"; "an emblem of human" and we want each one to love possessing it. This has birth an entire enterprise in Macrohard, that has scaled methods drastically using a "micro-programming-tasks" paradigm, to create a more balanced ecosystem, allowing "everyone" to contribute to development without stalled relationships and thus, without stalled projects. ETA to take all my steem-based interfaces to stable and use-able state is still this year as each of these interfaces have to be ready before the Smart Media Protocol is implemented by Steemit INC. I look forward to choosing a team over the course of time. Well, i have been on steemit for up to two years and now have a community on the SteemGigs discord approaching 6,000 members and i have come to identify brothers and sweeties and a "great team" is attainable. In my case, "talent" is not everything, "brother" more is. There are tons of talents worldwide, it is no standout. Other virtues even un(dis)talentedness is of more pertinence to me, among the things i seek out in brothers/sweeties. All interfaces are tied as a "true celebrity" will form a great SteemGigger (dream-builder), creating beautiful disruptions; "SurpassingGoogle".